Pixel Magic Lumin review | What Hi-Fi? Pixel Magic’s Lumin music streamer’s big selling point is its file compatibility. This wouldn’t normally be considered a particularly glamorous virtue, but when it comes to streamers it’s worth a pot of gold. This streamer can play back all the usual suspects – WAV, AIFF and FLAC – as well as those less commonly seen, such as Apple Lossless. The specification highlights are the ability to play up to 32-bit/384kHz PCM files (good luck with finding anything you want to listen to in this format) and the slightly more useful ability to replay native DSD music. The Lumin is the first standalone streamer we’ve reviewed with this capability. Curious as to what the player sounds like with DSD, we feed in Stevie Wonder’s 1973 classic Innervisions. Made early on in Wonder’s run of superb ’70s albums, this set is packed full of brilliant songs. Higher Ground is a stern test for any system, but the streamer makes relatively light work of the dense musical mix, keeping the hard-charging rhythm track moving along with considerable momentum. The player renders the textures of instruments well, and paints Wonder’s distinctive voice with a pleasing combination of delicacy and force. We’re taken with the unit’s ability to draw low frequencies with agility and articulation. Move to All In Love Is Fair and the Lumin has no issue dropping a couple of gears, showing impressive refinement and bags of dynamic subtlety as the song builds to its climax. Upbeat or relaxing – this streamer does both with ease. This streamer’s neat-and-tidy approach to music replay continues when we stream a (24-bit/192kHz) FLAC file of Mahler’s Symphony No.4. Here it delivers a decently sized soundstage and populates it with crisply drawn instruments. There’s good stability to the image even when the music becomes complex, and the streamer impresses with its ability to keep instrumental strands separate and easy to follow. Things are spot-on tonally, with all parts of the frequency range blending in seamlessly and evenly. There’s a consistency of character throughout the range that’s a real pleasure to hear. 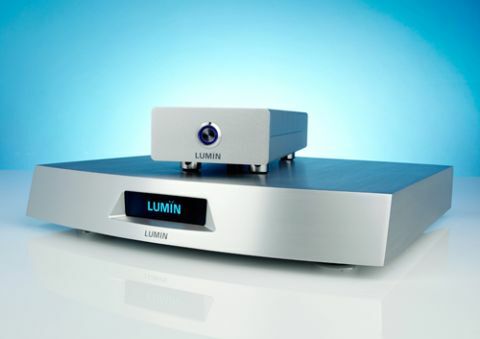 Large-scale dynamics are delivered with pleasing confidence even if the Lumin doesn’t quite deliver a full dose of authority. By the highest standards, this player has a slightly polite way with music, rounding off attack just a bit and taking the edge off rhythmic drive. But the upside is lovely fluidity. The news is equally positive with low-bitrate files such as a 256kbps version of Eric Bibb’s Flood Water. A file as compressed as this invariably loses a sizeable dose of subtlety, but through the Lumin it still manages to sound engaging – that’s not a feat many media players can match. Surprisingly, this unit has no digital inputs (bar a pair of type A USBs). That’s a shame as it means the impressive digital-to-analogue circuits, which have a pair of Wolfson WM8741 DAC chips at their heart, can’t be used to improve the sound of other sources. General build quality is excellent. The main unit’s casework is machined from a solid slab of aluminium and is generally finished to a very high standard. This kind of casing is more usually found on products that cost double this price. Add another £495 to the price we’ve listed and you can have one finished in black. The external power supply is built to similarly high standards. A design such as this keeps high currents and any related magnetic fields away from the sensitive audio circuits, which is always a good thing as far as sound quality is concerned. Take a look around the back and you’ll find the option of balanced XLR and single-ended RCA analogue outputs. The player works equally well through both. Delve into the set-up menus and you’ll find that it’s possible to vary the output.In this configuration the Pixel Magic can drive a power amplifier directly. There are notable gains when it comes to outright transparency and detail resolution over a system that has a dedicated preamp in the signal path. Of course, the system would have to be purist in the extreme, as the only source would be the player itself. There are a couple of digital outputs – one HDMI and the other a BNC coax – just in case you have a top-quality outboard DAC to add to your system. We don’t think we’d bother, because the DAC inside the product is talented enough. There aren’t any controls on the Lumin’s elegant front, so all functions are controlled by a dedicated iPad app. For the most part the app works well, though some of the buttons are rather small, and sometimes the controls aren’t wholly intuitive. But, give it a couple of days and most of it will make sense. Overall, the Lumin is a fine unit. It played everything we threw at it without complaint, and did so in some style. Add the lovely build into the equation and it’s clear that this unit is well worth serious investigation if you’re in the market for a high-end streamer.